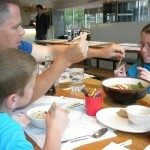 Eating at Wagamama.com, a chain of noodle restaurants in England. – sending food in a Rubbermaid tub for one child to eat on the way to the activity. – regrouping after all activities and eating very late for a school night. 1. What are some of your challenges getting your whole family to the dinner table? I have a kid, a preteen, and a teen who play sports and do activities. Hard to get all of us to dinner at once. A quorum for our family of 5 is 4 people at sitting around the kitchen table for dinner. 2. What are some of the rituals/rules you have around dinnertime? – Eveyone has to remain seated for the length of the meal. – Eat most of what is on your plate. 3. When your kids grow up, what will be one of their “food love memories” from their childhood? My oldest — the teen — will remember the story of the time I was stuffing FedEx envelopes while she sat in the high chair. I kept putting peas on her tray. As I stuffed the last enveliope I realized she had dropped all the peas on the floor. Good fine motor skills for a baby, though! The middle — the preteen — will remember the story of the time she was lying in the double stroller while we were at Chi Chi’s. I saw the stroller move back and peered in to see if she was OK but didn’t see her. I thought she had been kidnapped. Instead she had slithered down from the foot rest of the stroller on to the floor of the restaurant as my husband had not buckled her in. I was ticked at my husband for months! The youngest — the kid — will remember eating everything! He rarely ate babyfood as he wanted people food. He ate an olive last week. Loves salad. Good eater! 4. Do you have a favorite family recipe that your kids get excited about when they know you are making it? What are your thoughts on the family dinner? Leave a comment. ← Play Doh + Marshmallow Eye = Fun! ?